NGC 1999 is the green tinged cloud towards the top of the image. The dark spot to the right was thought to be a cloud of dense dust and gas until Herschel looked at it. It is in fact a hole that has been blown in the side of NGC 1999 by the jets and winds of gas from the young stellar objects in this region of space. Full Story. A vast hole in space has been unexpectedly discovered in a part ofthe universe thought to be packed with a cloud of dense gas and dust ? thelatest in a string of cosmic finds by the European Herschel infrared spacetelescope. Thesurprising hole in space has provided astronomers with a new glimpse atthe end of the star-formingprocess. "Noone has ever seen a hole like this," said study team member Tom Megeath ofthe University of Toledo in Ohio. "It's as surprising as knowing you have worms tunneling under your lawn, but finding one morning that they havecreated a huge, yawning pit." 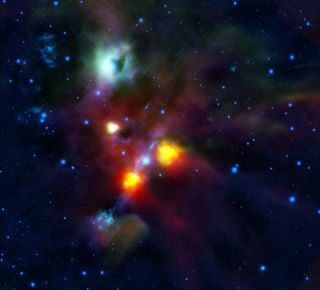 Starsare born in dense clouds of dust and gas, and while jets of gas have beenspotted coming from young stars, the process of how a star uses this gas todisperse surrounding debris and emerge from its birth cloud has not beenunderstood. Thislatest discovery by Herschel,an infrared space telescope built by the European Space Agency, may be an unexpected step in the star-forming process. Acloud of bright, reflective gas, known to astronomers as NGC 1999, is locatednext to a black patch of sky. For most of the 20th century, these black patcheswere understood to be dense clouds of dust and gas that block light that wouldnormally pass through. AsHerschel's infraredeye looked in the direction of NGC 1999 to study nearby young stars, thecloud continued to look black, even though the telescope's infrared technologyis designed to penetrate through such dense cloud material. This meant thateither the cloud was immensely dense, or Herschel had happened upon apreviously unexplained phenomenon. Astronomerscontinued their investigation using ground-based telescopes and found the sameresults when looking at the patch of gas. This led to the conclusion that thepatch looks black not because it is an extremely dense pocket of gas, but becauseit is truly empty ? something had blown a hole through the cloud. Theastronomers think the hole must have been opened when the narrow jets of gasfrom some of the young stars in the region punctured the sheet of dust and gasthat forms NGC 1999. The powerful radiation from a nearby mature star may havealso helped to create the hole, researchers said. Whateverthe exact cause of the hole may be, the discovery may be an important glimpse intothe way newborn stars shake off their birth clouds that helps astronomersdevelop a better understanding of the entire star-forming process, researcherssaid. Herschelis the largest and mostpowerful infrared telescope in space today. The European Space Agencylaunched the observatory into orbit in May 2009.